Life keeps getting in the way of my blogging fun! Hopefully blog normality will resume shortly. In the meantime, let's deal with life by eating chocolate muffins filled with strawberry jam, eh? Preheat the oven to 375 degrees F (190 C) and line a muffin tin with four muffin liners. Spray each liner with cooking spray. In a medium sized bowl, sift in the flour, cocoa powder, baking powder, and salt. Whisk or stir well and mix in the chocolate chips. In a small mixing bowl, whisk together the flax seed, oil, applesauce, sugar, milk, and vanilla extract. Start with four tablespoons of milk and you can add more if needed. Pour the liquid ingredients over the dry ingredients and fold everything together without overmixing. The batter should be quite thick and firm, though not crumbly. 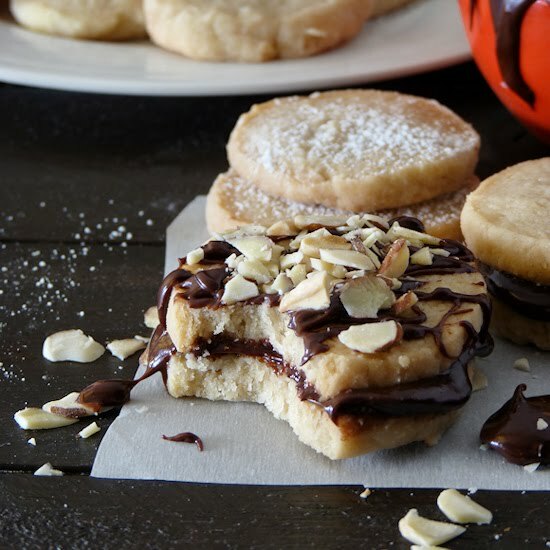 If it's too crumbly or dough-like, add a bit of milk to make it workable. Scoop the batter into each prepared muffin well, but only about halfway full. Use a small spoon to make a little well in the center of each muffin and drop a teaspoon of jam in each of them. Keeping the jam secured in its little wells will keep it from spilling out and making a sticky mess. Top with the remaining muffin batter. You can fill these all the way up to the top because the batter is rather thick and it will not spill while baking. 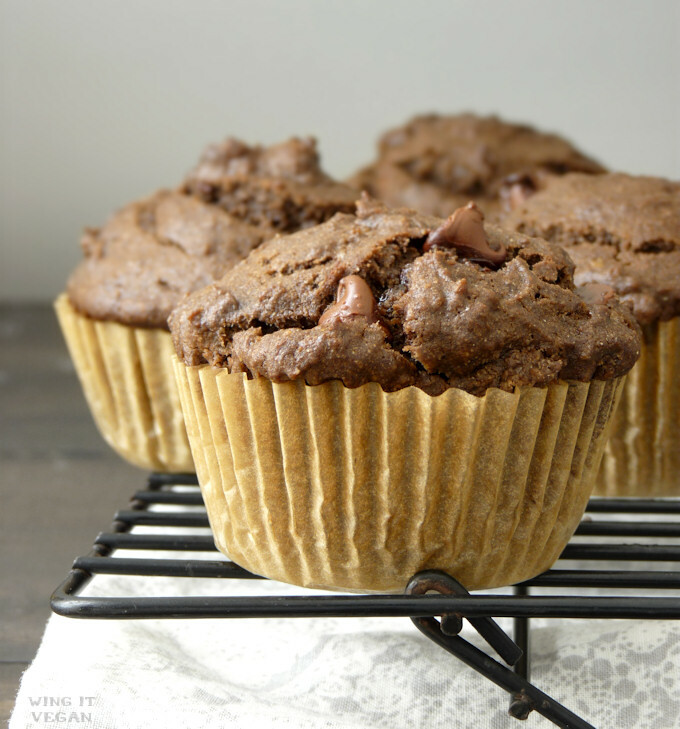 Bake for 15 minutes, then lower the heat to 350 degrees F (180 C) and bake for 10 more minutes or until a toothpick inserted into a muffin (watch for jam or melted chocolate chips) comes out with just a few moist crumbs. My first test batch had more jam in the middle, which ended up spilling over and making an oven mess. Fun! So, even though it's tempting to add more jam to these, the clean up isn't worth it. I like to use half regular cocoa powder and half dutch-processed cocoa powder to get the best of both worlds. You can use one or the other, or combine them like I do. My favorite test batch actually had 1/4 cup of cocoa powder and 1/2 cup of sugar, but they were really strong and I know not everybody likes that. 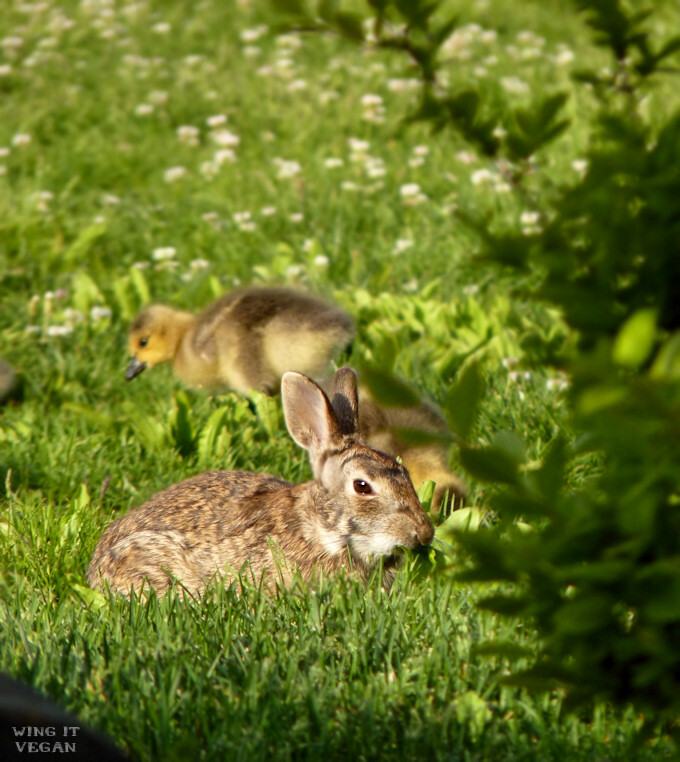 If chocolate muffins aren't enough to make up for my recent lack of blogging, maybe these photos of our back yard baby geese and bunny will do the trick? Papa Goose wasn't particularly pleased with Bunny, but Bunny was too busy eating grass and tasty leaves to care at all. Hang in there with the busyness! Those muffins sound so great. I am going to make some on my next day off where I don't have a million things to do!! And then later that day we had baby geese, bunny, AND baby ducks! I didn't get to take any photos because I didn't want to spook mama duck. I figured I only wrote like two lines of text for this post (plus the recipe) so I had to bring the cute up a notch to make up for it! 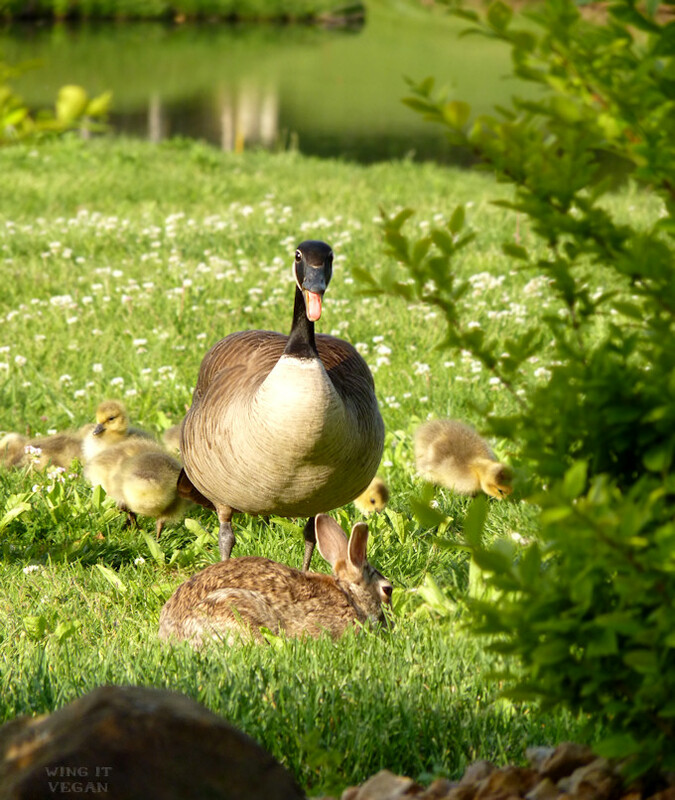 I think the papa goose is more concerned with the photographer than with the bunny. Who could be worried about a sweet little bunny? 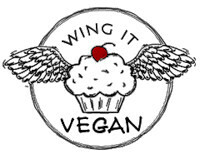 I'm having a "hungry day" and everything I see makes me want to eat it (only plant items, of course, not geese or bunnies), and your muffins are no exception. They look yummy. Fran Costigan explained when to use which kind of cocoa, but I can never remember. It has to do with whether the recipe contains baking soda, I think. Oh, I am very familiar with those hungry days. And the stronger the hunger, the more I look at pictures of food on the interwebs. That makes sense! Not. I swear I wasn't harassing the geese! At least not very much.